It’s refreshing when the head of marketing for a Consumer Packaged Goods (CPG) brand opens up and shares his insights on best practices around tracking and measuring the impact of digital marketing that drive in-store sales. For years, this has been a challenge as the ecosystem between retailers, data providers and manufacturers has been relatively immature. This summer, I had the opportunity to speak with Sanjiv Gajiwala, VP of Marketing at Mike’s Hard Lemonade and I asked him about how he had effectively streamlined his company’s ability to directly measure the effectiveness of their digital marketing efforts. In addition to this article, you’re welcome to watch the full interview on YouTube. Gajiwala explains that Datalogix fits within Mike’s Hard Lemonade’s social listening ecosystem. “We’re looking at brand health and what people are saying, but it helps us complete the picture with their purchase behavior,” he says. As Mike’s Hard Lemonade is sold nationally, I asked Gajiwala about how they review the geographical relevance of the sales data driven by their digital marketing efforts. “Datalogix and Oracle are doing the mashination including geographic and penetration data,” he said, with the understanding that some of these insights are a combination of Facebook geographic data and credit card transactional data. This gives Mike’s Hard Lemonade an additional layer of insights that help with better understanding purchase habits by consumer segmentation (i.e. heavy to light) overlaid with geographical penetration insights to help with better understanding geographical flavor profile preferences and where marketing budgets are best spent on a local geographical level. This allowed Mike’s Hard Lemonade to then track back to see if they are getting the same sort of lift from this new target of previously ignored heavy non-Mike’s users and determine if the incremental investment is performing in a similar fashion to their core marketing investments. “Our prospecting and our farming strategies are both different on social but just as measurable,” Gajiwala said. That is to say, with a relatively small team, everyone at Mike’s Hard Lemonade is accountable to the data. The bottom line here is that with the addition of the Datalogix reporting, Mike’s Hard Lemonade is finding new opportunities that it had previously ignored while, at the same time, seeing the direct impact on retail sales from its digital marketing efforts. This is the growing trend at retail. With a growing number of options to track and measure marketing impact, your ability to interpret data gives you a competitive edge. The most effective content and social media ads will receive increased and even incremental budget to ensure brand health and continued sales growth at retail. For more on this topic, see these two related articles: What It Takes to Exceed Shopper Expectations and Empower Retail Employees and Not All Retailers are Contracting. Here’s the Secret From One That’s expanding. Retirement Strategy: Why Is Bank Of America In TARP II? I’ve been getting some feedback as to why I would place Bank of America (NYSE:BAC) in the heart of the new model portfolio. Let me remind you that I have been a BAC bull for a few months now and have been pounding the table about its growth potential. Read this piece for a little background. As most of you know, I personally own a bunch of shares, model portfolio TARP has plenty of shares, and now it is tucked away with a starting position in TARP II. I am considering adding more shares for myself as well as for TARP II. BAC does not increase its dividend by 60%. Buffett changes his mind and dumps 700 million shares of BAC stock. Well, both of these risks were eliminated when BAC announced its intention to increase its dividend and Buffett quickly decided to exchange his warrants for 700 million shares. Risk off, right? Now shareholders were going to get a nice pop in the dividend, even with its small yield, and also have Warren Buffett as the largest single shareholder! Nice company to be with I would say and the information was given to all of us well before everything happened! So IF you bought the shares when I first started talking about it, this is where you would be in both growth and income: about 10% capital appreciation and a dividend increase of roughly 60%. Not bad for a few months of waiting right? Since the price of BAC was $ 24.38/share when added to the model, the price as of right now is $ 25.16, so an increase of about 4-5% in value has been added and that 2.10% yield is now down to 1.96%. Not to worry, though; there is more good news to come, AND we have 20+ years to let this stock “bake”. If we avoid another banking crisis, who knows, BAC might become a dividend champ, but in the very least, we can dump it and move the dollars into a dividend aristocrat eventually! The reasons I am even more optimistic about the share price appreciation are quite simple. The bank’s A1 rating has been put on review for upgrade at Moody’s, with the agency noting improvements to profitability and management’s commitment to a conservative risk profile. Moody’s also likes Bank of America’s more conservative than peers capital return policy (shareholders may feel differently). Taking a closer look at the economic projections, core PCE inflation is seen at just 1.5% this year, down 20 basis points from the June guess. Inflation is seen at 1.9% next year, down from 2% previously. The median forecast for the Fed Funds rate at year-end stays at 1.4%, suggesting one more rate hike is in the cards. The median for 2018 is still 2.1%, pointing to roughly three rate hikes next year. 2019 is lowered to 2.7% from 2.9%. Yields have moved a bit higher since the news hit, with the 10-year yield up 2.75 basis points to 2.276%. TLT -0.3%, TBT +0.6%. The two-year yield has risen to 1.43, its highest since July. Gold (NYSEARCA:GLD) has lost a few dollars per ounce, now flat on the session at $ 1,311. The markets have been sloppy this last week, but BAC moved higher, which is normal when interest rates are set to rise, and lending becomes more profitable. As far as I am concerned, capital appreciation has just begun. It isn’t that much of a stretch to say BAC will more than likely continue growing the dividend, so getting in when the share price is reasonable will give the yield a kick every time the bank announces a dividend increase. Obviously, I have no idea what the amount of the dividend might be in 20 years, but even if it just doubles to around $ 1.00 annually, at a share price of roughly $ 25, the yield on cost would be a rather sound 4%! Of course, if we wait and the share price rises even more before we add more, then that YOC would be lower. Given the fact that the stars seem to be aligned with the Fed, and the bank is making lots of money, tell me why I shouldn’t add more shares to TARP II, as well as my own personal account! It is VERY undervalued according to S&P Capital, as well as being EXTREMELY financially healthy. I like to get in BEFORE those 2 other metrics move higher, and I like riding the coattails of Warren Buffett! Growth is headed in the right direction as well as cash flow (great for larger dividend raises) and even book value is up. It sits at $ 27.43/share as of June 30th, so in all likelihood that metric has ticked up a bit Let me be conservative and say it’s now about $ 28/share. That translates into a growth potential of 11-12%, and it will possibly happen sooner than later because of the rising interest rates. Rising interest rates mean rising profits on loans at higher interest rates. That spells EPS, earnings per share, which keeps the upward trend going our way! I might not be the sharpest knife in the drawer, but I think buying more shares of BAC makes sense. I would really like to know the reasons YOU have for NOT owning BAC here. Convince me I am wrong! Knowledge is power, and many folks shy away from the investing world because that very world makes it more confusing each and every day in an effort to sell you something: stock picks, technical strategies, books, videos, subscriptions with “secret ideas,” gadgets, and even snake oil. Disclosure: I am/we are long BAC CHCT ED FB GILD GLD HRL LMT LOW LTC MO MSFT NEE NVS O OHI PEP QCOM T TBT TLT UUP V WBA WSM. Additional disclosure: The portfolio is for educational purposes only, and not an actual portfolio. 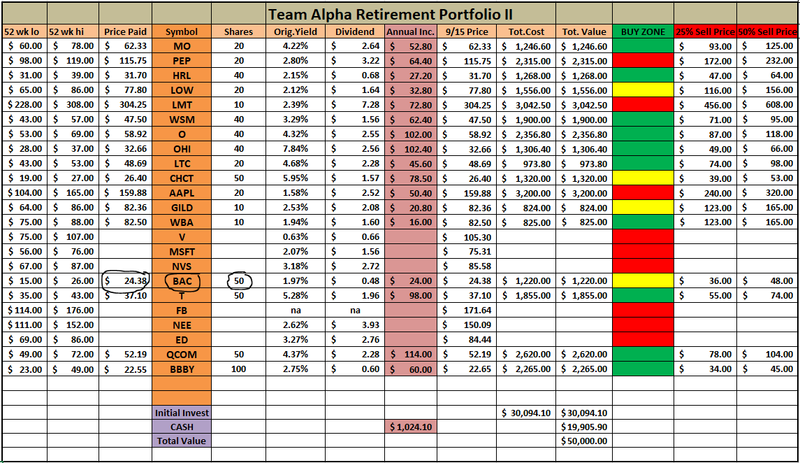 The long positions are based on the model portfolio. (Reuters) – Wal-Mart Stores Inc is testing a service to stock groceries directly to customers’ refrigerators as it seeks to take on e-commerce giant Amazon.com. The delivery of groceries and meal kits is emerging as the next frontier of competition among retailers. The grocery business is set to be upended through Amazon’s acquisition of upmarket grocer Whole Foods last month and the online retailer is also entrenching itself more deeply in the restaurants business. Amazon Restaurants on Friday teamed up with online food ordering company Olo whose network of restaurants includes Applebee’s and Chipotle. The partnership will help Olo’s restaurant customers connect with Amazon’s delivery services. The competition in the meal-kits business is also heating up. Supermarket operator Albertsons Cos Inc said it would buy meal-kit delivery service Plated while rival Kroger-owned Ralphs started selling meal kits in stores this week. As part of the test, Wal-Mart delivery persons gain access to a customer’s house using a pre-authorized one-time passcode and put away groceries in the fridge and other items in the foyer. Homeowners would receive notifications when the delivery is in progress and could also watch the real-time process from their home security cameras through the August Home app. The Bentonville, Arkansas-based retailer has been exploring new methods of delivery and in June said it was testing using its own store employees to deliver packages ordered online. The Internet security Cloudflare is charging ahead with an unusual campaign to demolish Blackbird, a patent firm run by a group of lawyers who Cloudflare accuses of engaging in unethical practices. On Thursday, Cloudflare announced it has paid out the first $ 15,000 to people who discovered documents that could help invalidate Blackbird’s patents. The money is part of a $ 100,000 war chest the company announced this spring, and is using in its quest to bring down Blackbird. Cloudflare has labeled Blackbird a new breed of “patent troll”—a derogatory term for companies that don’t produce anything, but instead amass patents in order to extract money from companies that do. While patent trolling is hardly new, Cloudflare claims Blackbird is especially infamous because it is run by lawyers and may be engaging in illegal fee-splitting arrangements with patent owners. Blackbird did not immediately respond to an email request for comment but has in the past claimed its business model is a cost efficient way for small inventors to assert their rights. In the blog post, Cloudflare adds that it is “just warming up” and intends to pursue challenges against at least 10 other Blackbird-controlled patents. If the challenges are successful, this would likely put a major crimp in Blackbird’s operations or possibly force it out of business altogether. Finally, Cloudflare is expanding a separate campaign that asks legal disciplinary bodies to punish Blackbird lawyers for violating the profession’s fee-splitting arrangements. Cloudflare has already lodged complaints with the state bars of Massachusetts and Illinois, which have yet to issue a ruling, and on Thursday said it has filed an additional objection with the United States Patent and Trademark Office’s Office of Enrollment and Discipline. FRANKFURT (Reuters) – Innogy, Germany’s largest energy group by market value, will spend up to 1.2 billion euros ($ 1.43 billion) in e-mobility, photovoltaics and glass fiber networks by 2019, it said in a statement on Thursday. Innogy has an existing investment plan of 6.5-7.0 billion euros over the next three years and it was not immediately clear from the statement whether the 1.2 billion would come on top of that or are part of the existing budget. The group, which is majority-owned by RWE, also said that there would be “no taboos” with regard to its portfolio on its way to become a leader in all relevant markets by 2025, not specifying further.